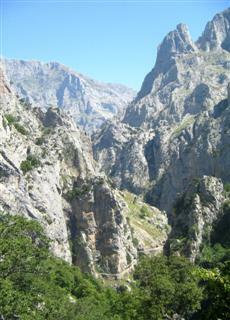 8 days: 6 days single-centre based, guided walking in the Picos de Europa, Spain. Average: length 6-7 hrs, altitude gain 700m. 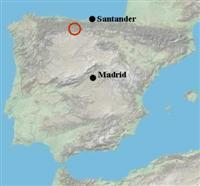 Pick up from Santander (possibility of transfer from Bilbao—please check before booking) and all transport for the week, guided walks led by your host and mountain leader Mike Stuart, accommodation at Casa Gustavo with en-suite rooms, breakfast, packed lunches and 3-course dinner with wine. The Picos de Europa are a majestic range of limestone mountains in the north of Spain rising abruptly from the Atlantic coast just 20 kms to the north. Made up of three distinct massifs, the region is characterised by steep-sided valleys, huge towering cliffs, isolated pretty villages and rugged limestone peaks reaching over 2600m in altitude. Your weeks guided walking holiday will explore the numerous facets of these fascinating and spectacular mountains shaped by the action of ice and water. Designated as Spain’s first National Park, the region is home to some of Europe's most impressive wildlife species, including wolf and bear. The Picos de Europa enjoys a temperate climate with the coast and the western mountains creating Spain’s green landscape, whilst the valleys of Liébana, lying on their eastern flank, experience a much drier and more arid climate. For the most part the guided walks are centred around the moderate/challenging grade. Some days can be varied to allow for easier or more challenging walks. A reasonable level of fitness is required along with a good head for heights and surefootedness. Paths in the Picos de Europa are generally good though sometimes rugged and stoney and on mountainous terrain. A gentle introductory walk with an ascent of 500m through oak woods, interspersed with open glades. The summit affords stunning 360° views of the Cantabrian mountains, the valley of Liébana and the eastern massif of the Picos de Europa. Adding to the interest are the remains of an ancient fort and the opportunity for a dip in a lake. From this scenic village lying under the prominent landmark of Peña Ventosa (windy peak) in the Picos de Europa, we walk up through well-established, indigenous Holm and Pyrenean oakland rich in birdlife. An ascent of 600m brings us to open heath and pasture with views of the old market town of Potes in the distance below. Today we cheat and catch the cable car to take us high into the heart of the Picos de Europa. Our goal, Pico Padiorna, 2,319m, may involve a little scrambling but with the option of resting and communing with the dare-devil Alpine choughs or, if you're lucky, Snow voles, if you don't want to make the summit with its views down into the hidden valley of the Vega de Liordes. Probably the best-known of the walking days in the Picos de Europa, an earlyish start and an hour's drive take us to the start of the walk at Poncebos in the western massif of the Picos. From here a gentle incline to begin with takes us into the gorge proper, the clear blue-green waters of the River Cares below. The track levels out with breathtaking views of limestone peaks above. We should meet friendly goats and witness Griffon vultures soaring between the cliffs. After a refreshing drink (or two) in the bars of Cain, we return following the contours of the hydro-electricity canal. Shortly after leaving Cucayo a wonderful photo opportunity appears of the village's spreading, rusty-red pan-tiled roofs of the old houses and barns. The path rises through shady woods, a mixture of Beech and oaks, and crosses streams to lead us up to the pastures below Peña Prieta, the highest peak of the Cantabrian mountains. This is bear and wolf country so the grazing livestock are accompanied by the local breed of large dogs. Don't worry though, they're used to people and often sniff out a packed lunch! This high pasture is cobwebbed by rippling brooks and is a perfect place for cooling our feet. Ascent can vary between 700 - 1,000m, . Back up to the cable car, we take a track leading under the big rock face of the massif of Peña Vieja (Old Peak), the highest point in Cantabria. Keeping our eyes open for Wallcreeper, a rare, beautiful, butterfly-like bird, we should see Chamois leaping the rocks and the chance of Golden eagles flying above. We reach Horcados Rojos with tremendous views of the Picos' most famous mountain, Naranjo de Bulnes. An ascent of about 700m. Once you have booked on this guided walking holiday, further information about the walking, the Picos de Europa region and what to bring, will be sent to you. We do have a web page dedicated to what clothes and equipment you should bring. In addition, our travel shop has direct access to all the top walking and travel retailers. Please contact us if you need any further information. Please Note: We will endeavour to keep to the walking days described above as far as possible; however they are subject to change. In addition, we like to maintain a certain degree of flexibility to take account of the group’s abilities and interests, and the local conditions. The final selection of walks will be made by your guide during the week after consultation with the group. Casa Gustavo, is a 500 year-old farmhouse converted to a friendly and informal guesthouse managed by your welcoming hosts Lisa and Mike Stuart and now shared with children, cats & dogs. This ancient and atmospheric old house makes a great base for our week's guided walking holiday in the Picos de Europa of North Spain. It has a captivating charm with it's thick stone walls, solid oak beams, wonky, wooden floors and interesting doors. There is a flower-filled courtyard with barbecue where dinner is served on hot evenings. Evening meals are three set courses of good food making use of as much local and seasonal produce as possible. They could include goat cheese and pear salad, Lisas’ lentils with chorizo or Mikes’ paella, all accompanied by plenty of our “extremely quaffable” house wine. Cheap flight deals can be found with Ryanair into Santander from London Stanstead (plus other european cities including Dublin) or Easyjet into Bilbao or Oviedo. For these last two options, please check with us before booking. We would be happy to book travel arrangements to the Picos de Europa in Spain on your behalf for this guided walking holiday. www.seat61.com or "The Man in Seat Sixty-One" is an excellent site for train aficionados. You can use Rail Europe's train finder in our travel shop to organise and book your train journey.